You can read parts one and two in the series first if you'd like. Let's face it, Moms worry too much. We ought to trust God to care for every little part of our lives, but we often fail. 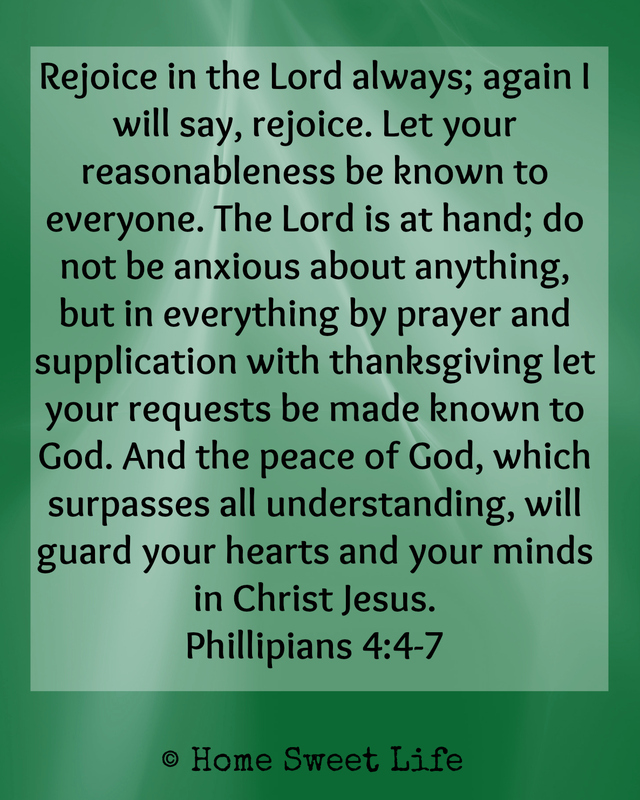 Too often we need to pray "I believe, help my unbelief!" While we're working on learning to draw near to God and trust Him to orchestrate each detail of our lives, I want us to think a little bit about a topic we often worry about - money. Money is a tool. In itself money is neither good nor evil, yet how we view it, and how we use it, tells a lot about our character, and how much and what we love. I think maybe the biggest struggle we Moms have with money is the world we live in. Here in America we are constantly bombarded on TV, on the radio, in print, and in person by ads that tell us we need more, more, MORE. More what? That is my point. The world tells us we need more of everything: more clothes, more toys, more electronics, more square footage in our homes. The world is always telling us we need more stuff because more stuff keeps us focused on the stuff, not on God. I will let you in on something I have learned - stuff is just stuff. Material goods cannot heal your broken heart, they cannot fill the void in your day, nor can they comfort you in your distress or old age. Yet, even knowing all of this, we can fall back into worrying about money. Lots of things we need in our daily lives cost money: food, homes, cars, even toilet paper! 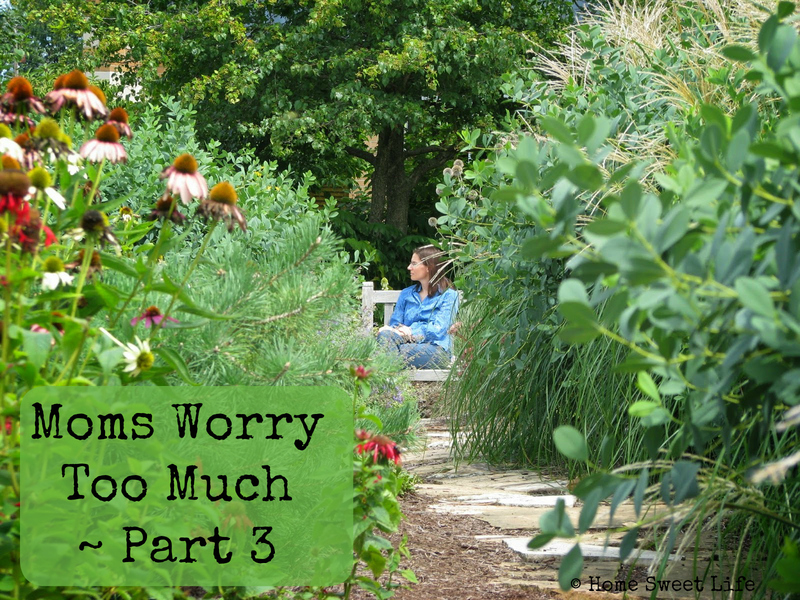 As the managers of our homes, we can get sucked into worry about providing things for our family. We need to step back from the world and be reminded of an eternal truth. All we have is from God, and it still belongs to Him. God gives us the opportunity to join with Him in providing a home for our family, yet the real Provider is still God alone. God grants us everything. Moms, money can buy your child a new toy, but not love. Money can buy a new book, or new tires for your car, yet it cannot give you peace. If you put your hope in money, then your hope can easily be lost. Someone could give you a million dollars tomorrow and you would not have peace, because money cannot buy peace, only stuff. God is what we need more of. God provides for all of our needs. He cares for us. He cares so much that He sent His Son Jesus to die on our behalf, to pay the penalty for our sins. You may not get everything you want from God, but you will get everything you NEED. Moms, if you're still worrying about money, it is time to give your worry to God and let go. Tomorrow you may not have any more money in your bank account than you do today, but you can have peace. 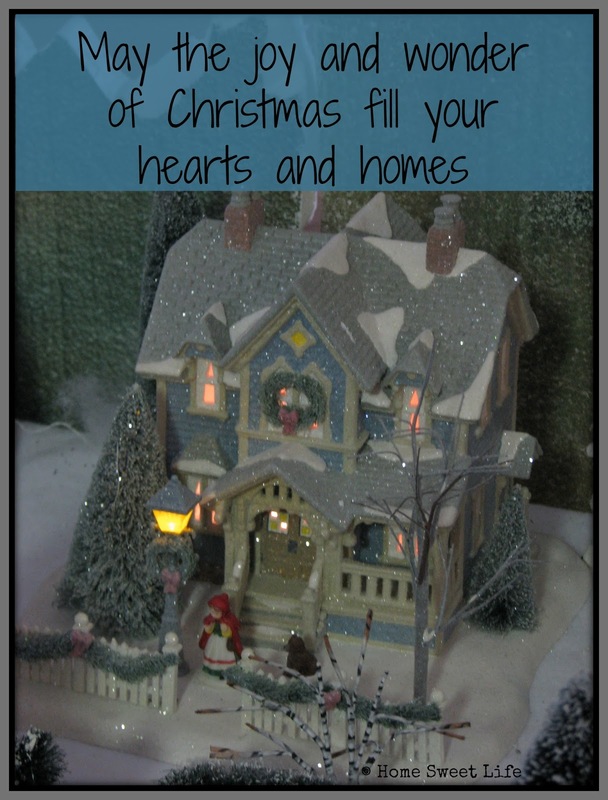 You may still have a kitchen cabinet that is empty, but you can have peace. You may still wonder tomorrow how you will ever pay those medical bills, yet you can have peace. God has blessed us beyond measure with His great gift of forgiveness. He wants to grant you a peace that is beyond understanding. God wants you to trust Him to provide for your needs. The first step to learning to trust God to provide for our physical needs is to understand our Spiritual need. We need forgiveness for our sins. 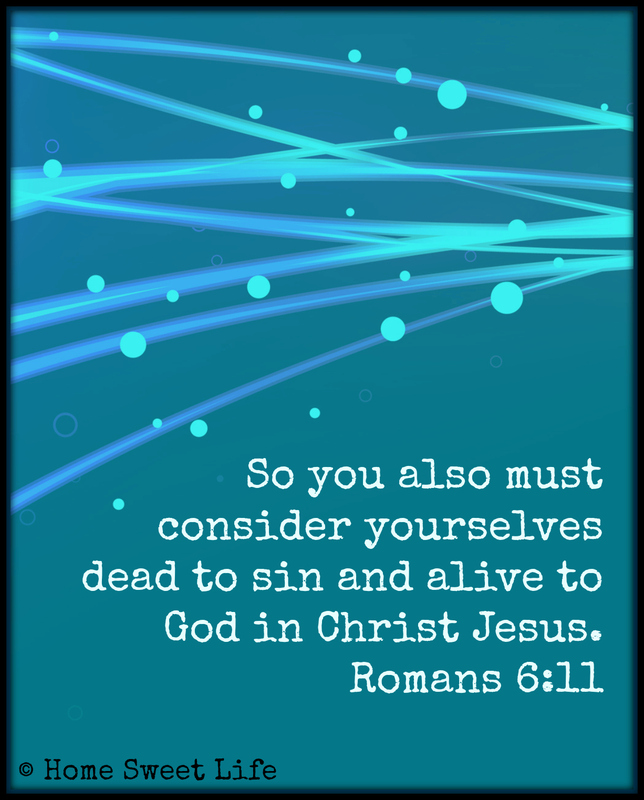 We are all sinners, and forgiveness comes through Jesus alone. Once we accept His great gifts of mercy and forgiveness, once we understand our eternal need has been met, we can slowly begin to trust God for our daily needs. It is a long road to walk, this learning to trust God for everything, yet it is one filled with joys unspeakable. 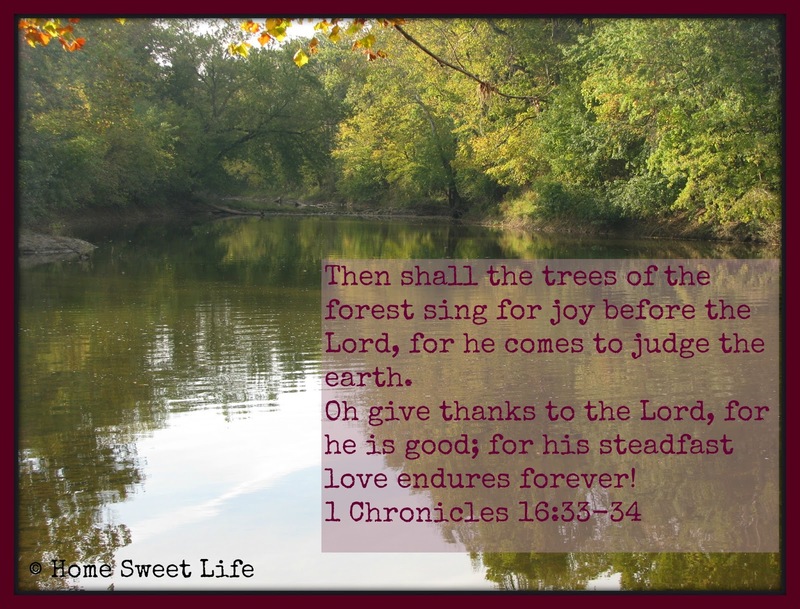 May these verses give you hope for your journey! May you choose the path of following Jesus, and may your New Year be filled with joy and peace as you learn to trust in Him! I know that many of us, especially Moms, can struggle with the Holidays - and our attitudes about them. I have had years when I went sailing with delight from Thanksgiving through the New Year, and others when I was awful. . . and I think I made other people feel awful too. If you were one of those who took the brunt of my bad attitude - I'm sorry. Because I know I've struggled in years past to keep a good attitude through the Holidays, I just wanted to share a little hope with you. 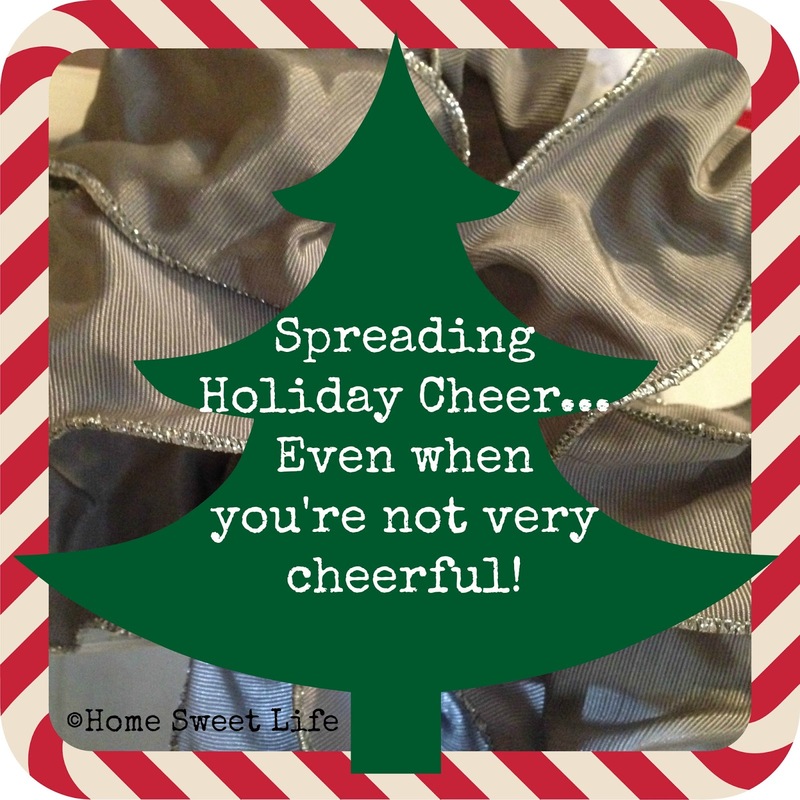 You don't have to be cheerful to spread holiday cheer, but you DO have to make a choice to not ruin other people's celebrations with your bad attitude. If you're struggling today, know that God knows your heart and He sees what you're going through. Whether you're stressed out by family relationships (or lack thereof,) a recent job loss, loss of a loved one, or just a general feeling of being overwhelmed at the holidays. There is hope. That hope is found in Christ alone. 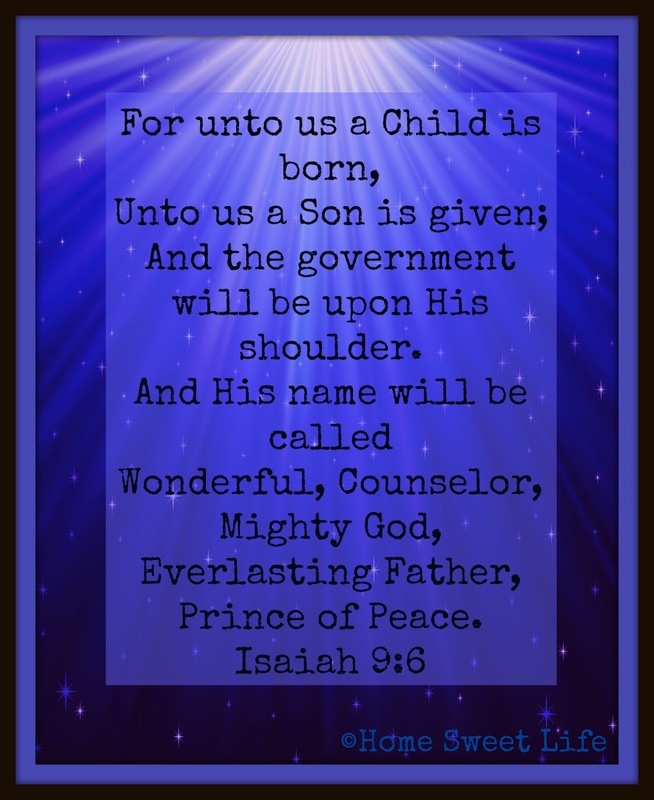 For those of us who celebrate Christmas, has our celebration strayed from the birth of Christ, our Messiah? We should be celebrating His coming, because without His birth we could not accept His gift of forgiveness when He gave His life for our sins. Without Christ's birth, there would be no Easter. If you are feeling depressed about Christmas, your ideas about the Holiday have shifted somewhere else. 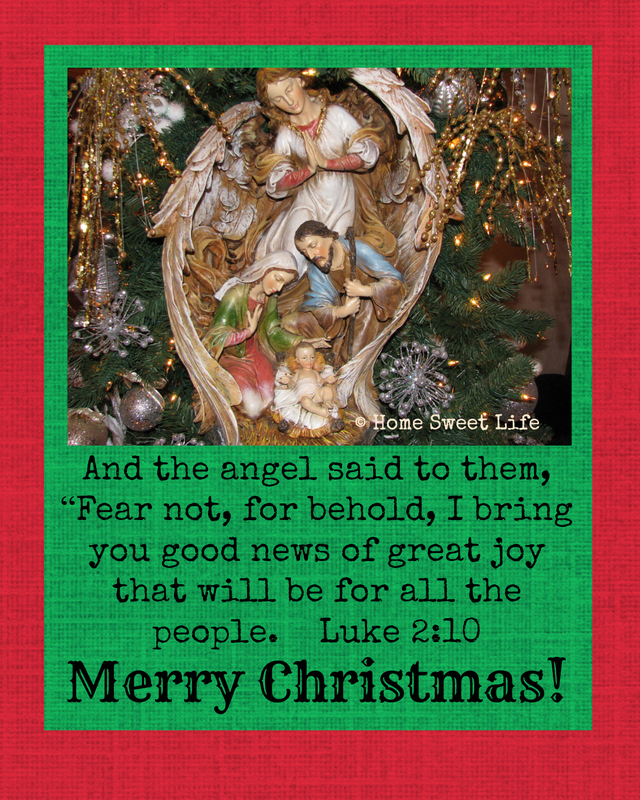 Jesus' birth brought rejoicing, not sorrow. If your struggle this holiday season is with a loss, family member, friends, a job, know this - God sees all you are going through, and He wants you to depend on Him alone. His mercies are new every morning, and He desires to have a closer relationship with you. It matters not how long we have known God, it matters that we trust Him to be the ruler of the Universe, and the Lord of our lives. What are you choosing for today? Are you choosing to trust? Are you choosing to join in with others to celebrate the Holidays? Are you choosing to make a good memory, however small, of time spent together with friends and loved ones? Whether you live on top of a mountain, or in the bottom of a pit, only YOU can choose your attitude for today. May you choose one of joy and share it with the hurting and needy around you. Choose today to be thankful for all you have already received. Choose today to not focus on the decorations or the food or the presents. 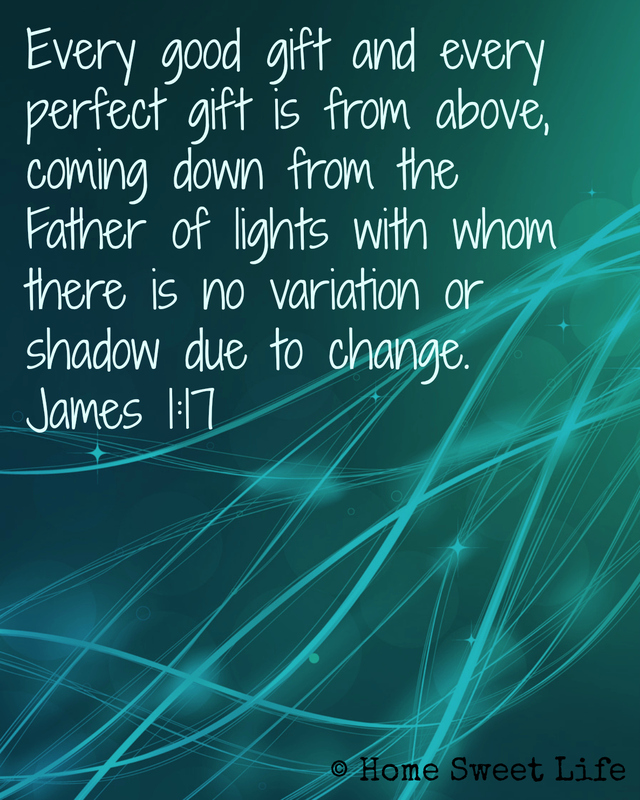 . . choose today to focus on the GIFT of Christ Jesus! May your heart rejoice in Christ our Savior, may you join in the mighty chorus of praise. May God open your heart to His wonderful gifts. Will you join me in singing? Hello blog land! 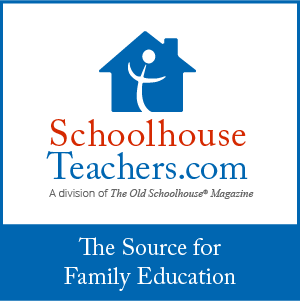 I've just posted a way-overdue update to my review of SchoolhouseTeachers.com. It's over in the right sidebar, under the pages section. 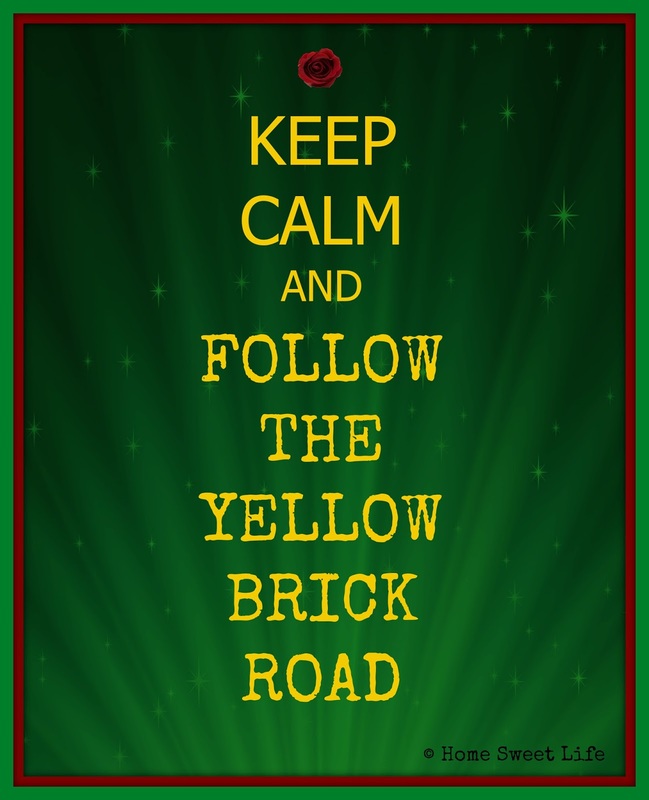 . . or you can just click here! 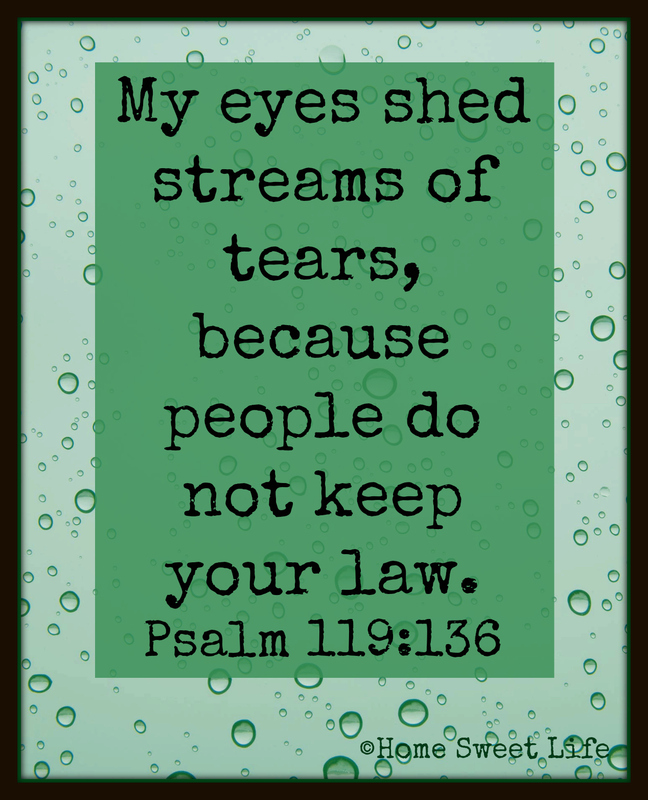 In the book of Romans, Chapter 12, verse 15, we are told to "Rejoice with those who rejoice, weep with those who weep." After many days of prayer on behalf of a friend who has suffered great loss, we had the opportunity to rejoice with friends on Tuesday evening. Both commands are great, and call us to support those around us with love. They show the heart of Jesus to those whom we share with. They offer both His comfort and His encouragement. 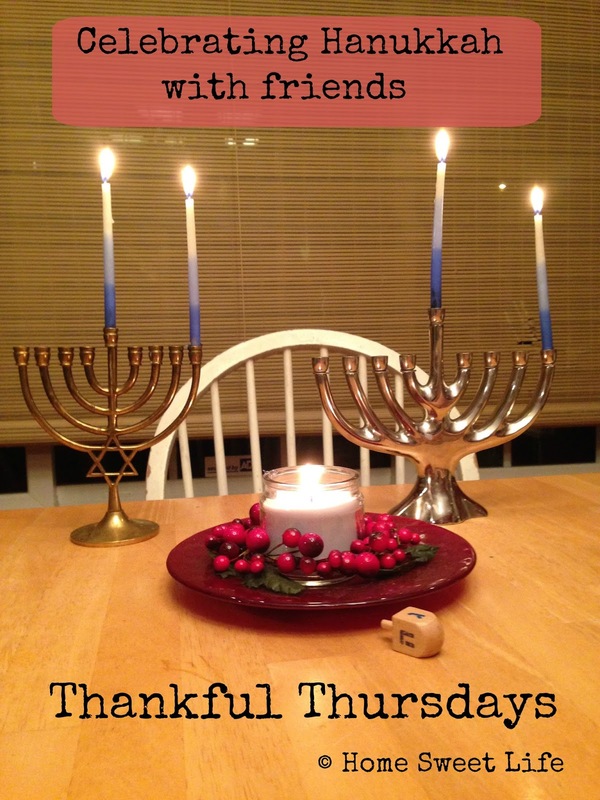 Tuesday night we celebrated the first night of Hanukkah with friends. Hanukkah means dedication, and is a Jewish holiday that remembers when the Temple was freed from the control of the Syrian Greeks in 165 B.C. and the Jews re-dedicated it to purify it from what the Greeks had used it for (worshipping false gods and unholy practices.) While I am no Hebrew scholar, I think I understand enough to know why our friends of Jewish heritage celebrate. Their hearts are overflowing with thankfulness of the miracle God wrought on their behalf by allowing the dedication oil (that appeared to be only enough for one night) to last for all eight nights of purification. In the grand scheme of Jewish Holidays, Hanukkah is often considered only a medium holiday, yet one which our friends freely share with us. There is joy is rejoicing with those who rejoice! There is also great joy on our behalf, knowing that these particular friends of ours are Messianic Jews, who also worship Christ as their Savior. For myself, this simple celebration with our friends reminds me of how God has grafted me into the vine of His people through Christ's redeeming grace. Celebrating Hanukkah with our friends reminds me that God does still work miracles of provision in our lives. His great hand that provided for the Widow of Zarephath so she could feed Elijah in 1 Kings 17, also provided the oil for the temple purification celebrated at Hanukkah. We have often seen that same great hand provide for all of our family's needs when there just didn't appear to be enough. 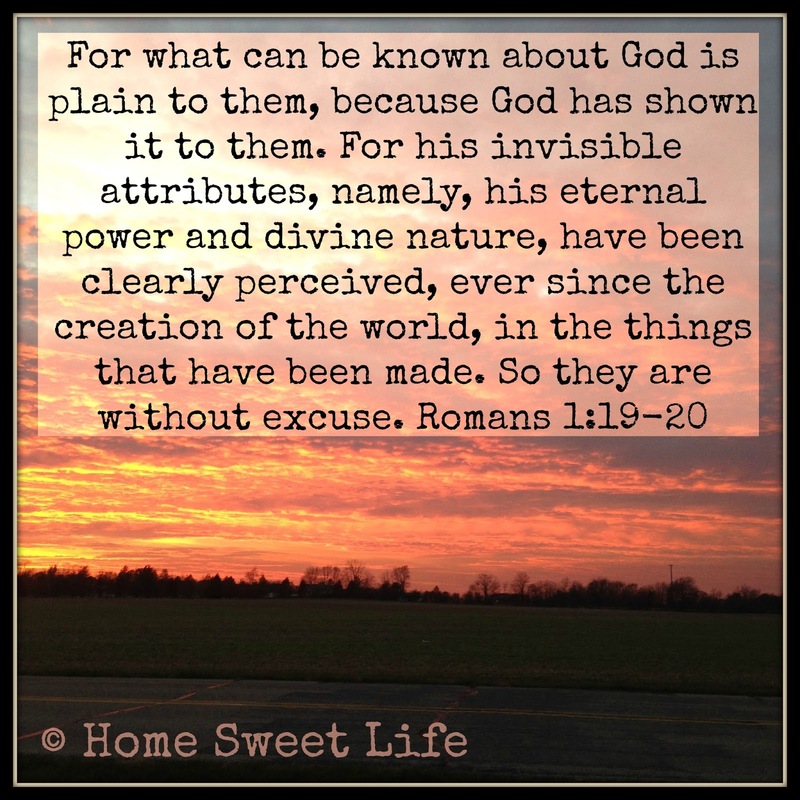 We know that God created all that there is (Genesis 1:1,) and He still owns all the cattle on a thousand hills (Psalm 50:10,) there is no need too great for Him to provide (Philippians 4:19.) Whether you have spent your week mourning with those who mourn, or rejoicing with those who rejoice. 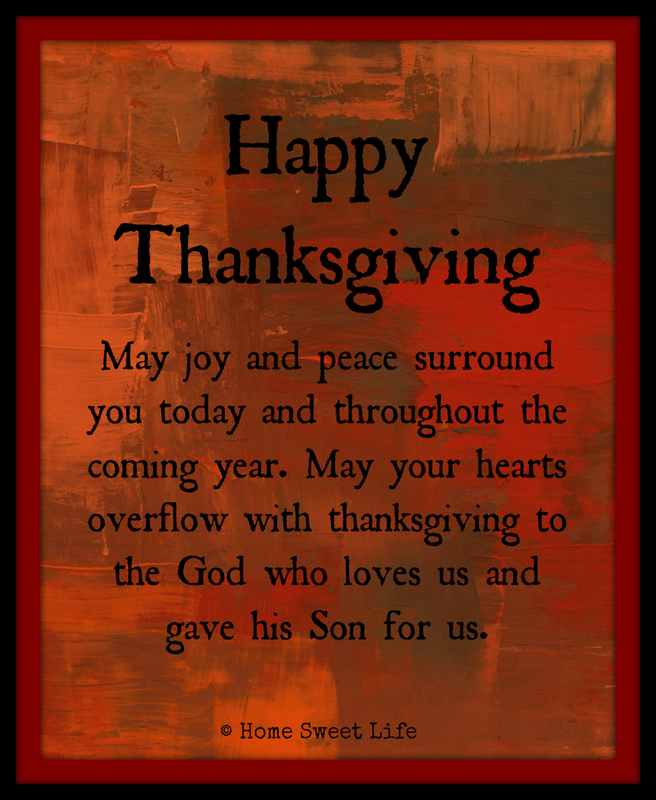 . . please choose to join us in offering a thankful heart to the God who continues to provide for us all! 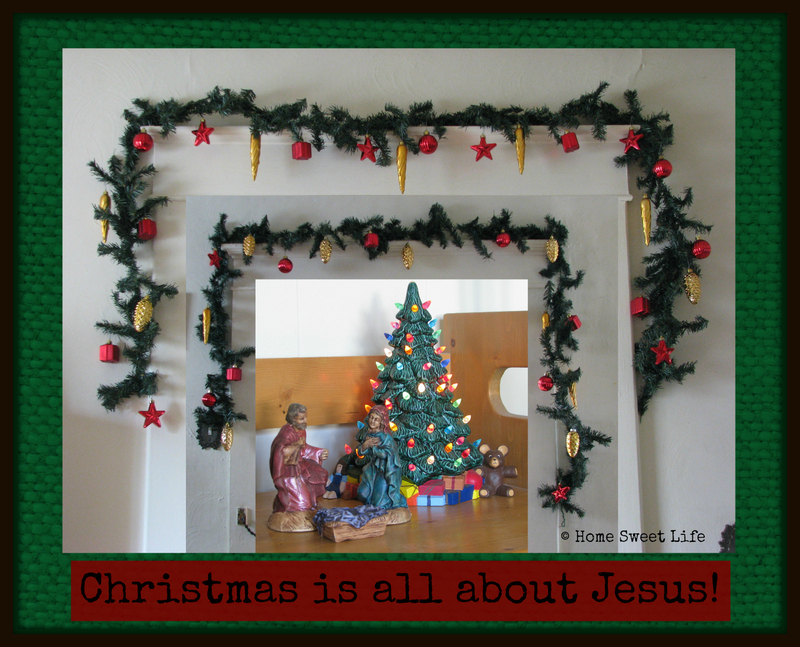 Several friends have posted recently about their Christmas decorations. I like Christmas decorations, I always have. For me, they point me to the manger, where Christ was laid as our newborn King. Christmas decorations can be big or small, or none at all. Whatever you choose, I pray you look to the manger, find a Savior, and be like the shepherds who pointed others to Christ. This year our decorations are small. Our tree is a ceramic one my Dad painted when I was little, before it sits the tiny manger scene I painted when our girls were little. We are celebrating our Savior's birth. The baby Jesus will be added Christmas morning. I celebrate Christmas because it constantly reminds me of Jesus' purpose in coming to earth, to give his life as a ransom for mine. We celebrate His victory over death at Easter, but today, we're celebrating His birth. 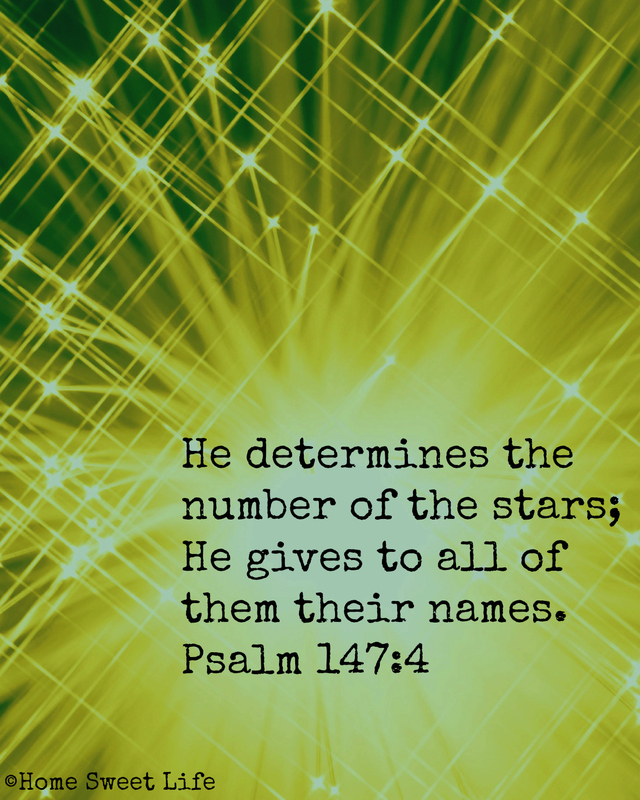 Psalm 147:7 tells us that God named all of the stars. I live in a small city, there are a decent amount of streetlights, so most mights there are only a few dozen stars visible. I grew up out in the country, where on a clear night you can see hundreds of stars over the open fields. When I look at the pictures taken by telescopes, I see thousands of stars. I am thankful for a God who can give the stars each their own name. I am thankful for a God who is big enough to remember all their names, and still remembers me. I am thankful for His grace and mercy, and I am reminded of them every time I look at the night sky. Even in the winter, when the wind is cold and blows the snow clouds across the moon and stars, I can look up to the heavens and know the stars are there. Even when I can't see the stars, they still have names. God knows their names, and He knows my name. What blessed thought! I am thankful for the birth of my Savior, Jesus Christ. 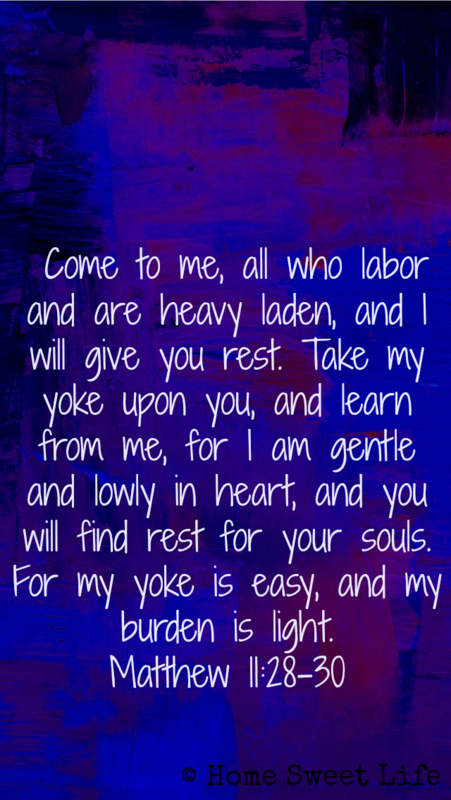 In the midst of all that happens in our world, I know I can find peace and rest in Him. 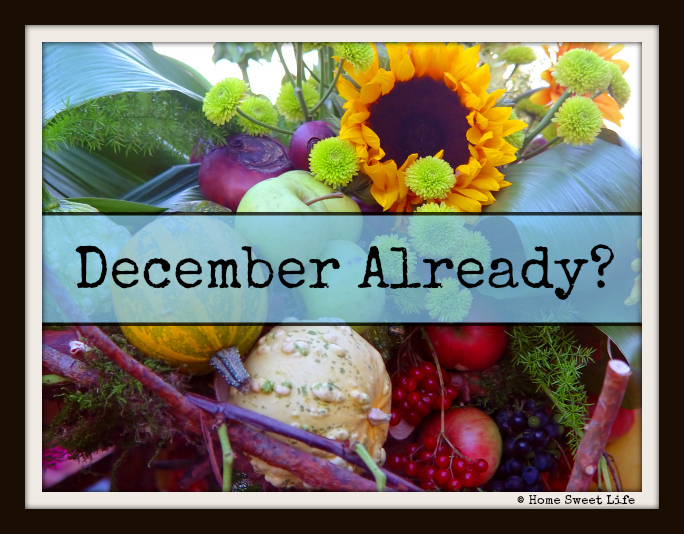 Some of you may have awakened this morning to the startling realization that it is December First. You might have been happy, you might have been sad. Just last week we were celebrating Thanksgiving, and now? Some people are jumping into celebrating Christmas with both feet, some are busy cleaning their houses from Thanksgiving guests, and others are just wondering just how to survive another day. 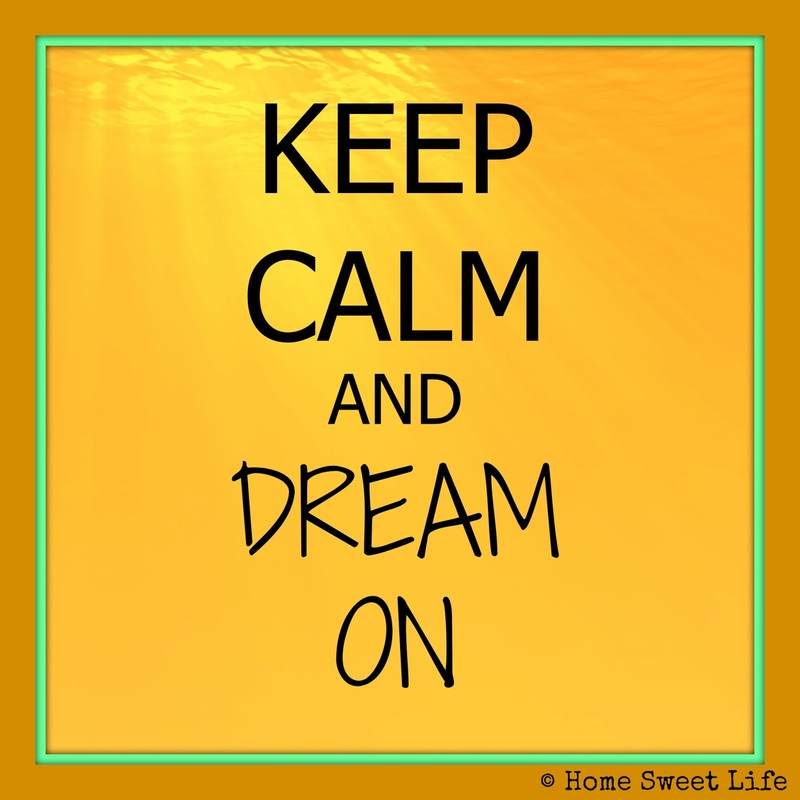 How about taking a deep breath or two. Inhale, exhale, inhale, exhale. Life can pass by quickly and we can get too wrapped up in what is coming or what just passed instead of remembering that we are supposed to be living today, not re-living yesterday or pre-living tomorrow. 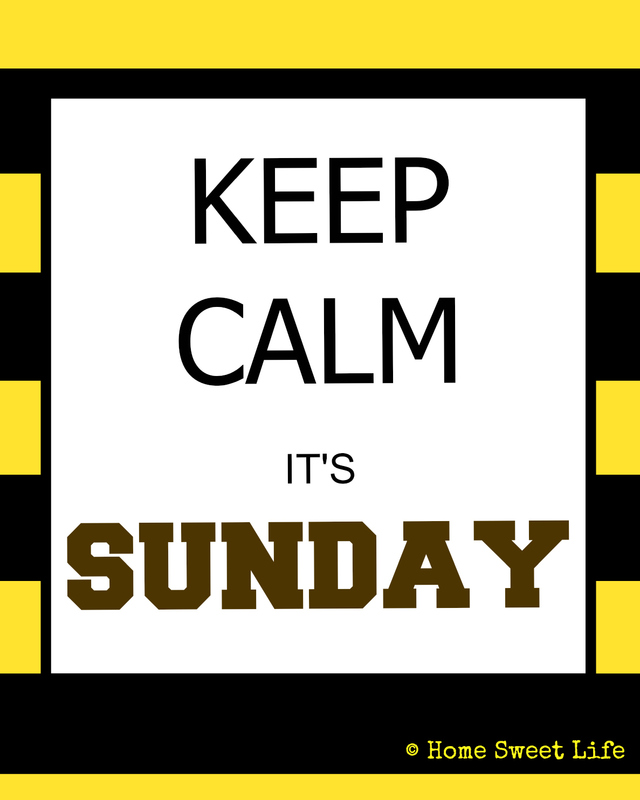 Take a few moments to ask God for peace about what you did (or did not) accomplish today. Hug your children, kiss your spouse, today is only 24 hours long. 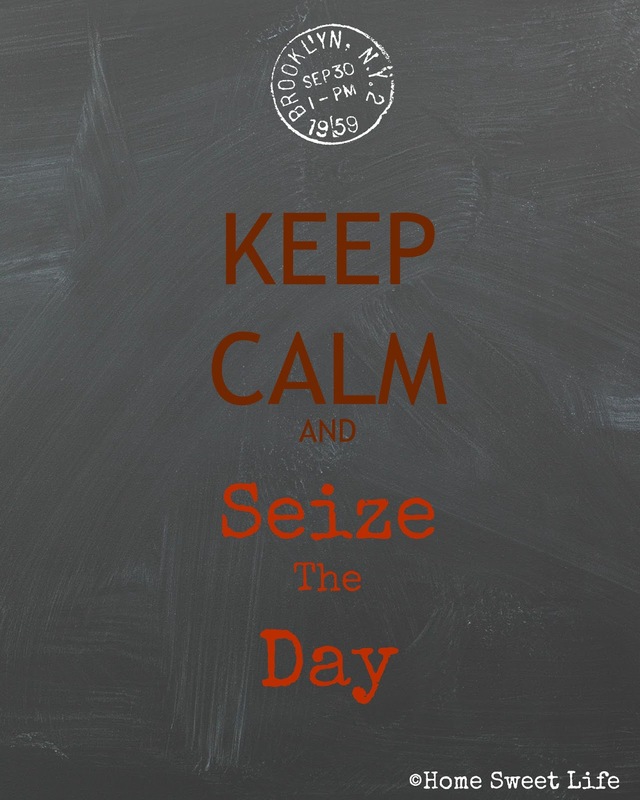 Make it memorable by being here, living today - today! Lots, and I mean LOTS of people are out Black Friday shopping. I think we're going to the grocery store later, but I'll pass on the mayhem of the retail stores. If you're looking for nice, meaningful gifts, maybe you want to look over some of the companies we've done reviews for this year. Some of them are having Black Friday sales. In all your plans for Thanksgiving tomorrow, I'm sure you've put a lot of thought into what to serve for dinner. Some of you probably even planned your summer garden around the holidays, being sure to have lots of cucumbers to pickle, or squash to bake. Are you having a salad too? There are so many seasonal favorites that our families come to expect: turkey, mashed potatoes, green beans, stuffing, pumpkin pie. 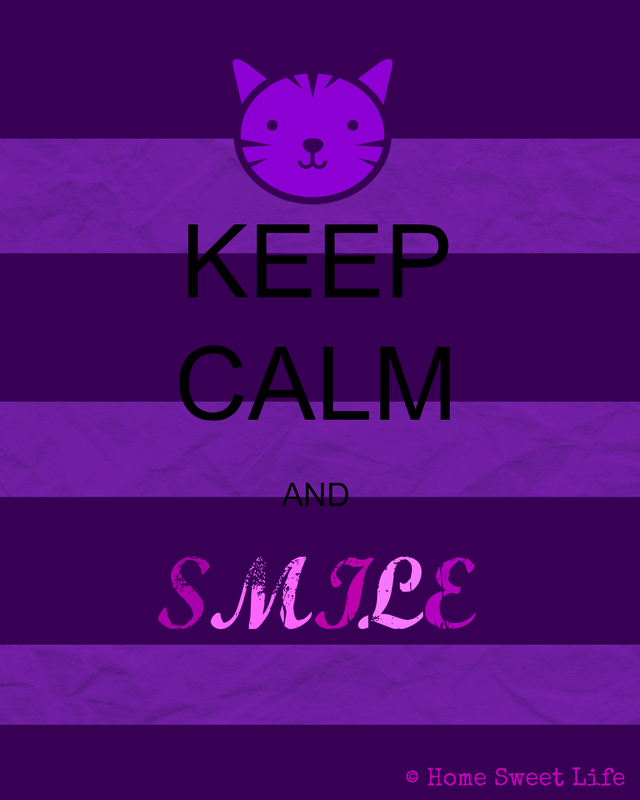 . . you get the idea. I'm asking if you've thought about a salad because I know A LOT of you are having guests. Salads are good for a lot of people. Besides the usual use of keeping you from overeating fats, and keeping your digestive tract moving, salads are a lifesaver. In a day when it's hard to keep track of everybody's dietary choices and restrictions, salads are a great bet. If your cousin brings his girlfriend and she's a vegetarian - no problem, have a salad. If your niece just got put on a gluten-free diet- salad is a safe option. If your newest neighbors are of Jewish decent, salads can be a great go-to. Here's how to make a great salad. Wash the lettuce and put it in a bowl. That's almost it. Now, because some people might be allergic to nuts, or pork, or gluten . . . put all the toppings in small bowls on the side, each with its own spoon, and place the dressings nearby. Let your guests decide what to add (if anything) to their salads. Some suggestions: sliced boiled eggs, raisins or chopped grapes, sunflower seeds, croutons, shredded cheese, tomatoes. . . the list could go on and on. Some guests may want to put their turkey in their salad, others just want a safe food to eat while they're trying to learn everybody's names. Make their day a little brighter, serve a salad! What? You say you have extra salad left over? That's ok, after a day of being thankful for food, you'll probably want to eat it yourself on Friday! 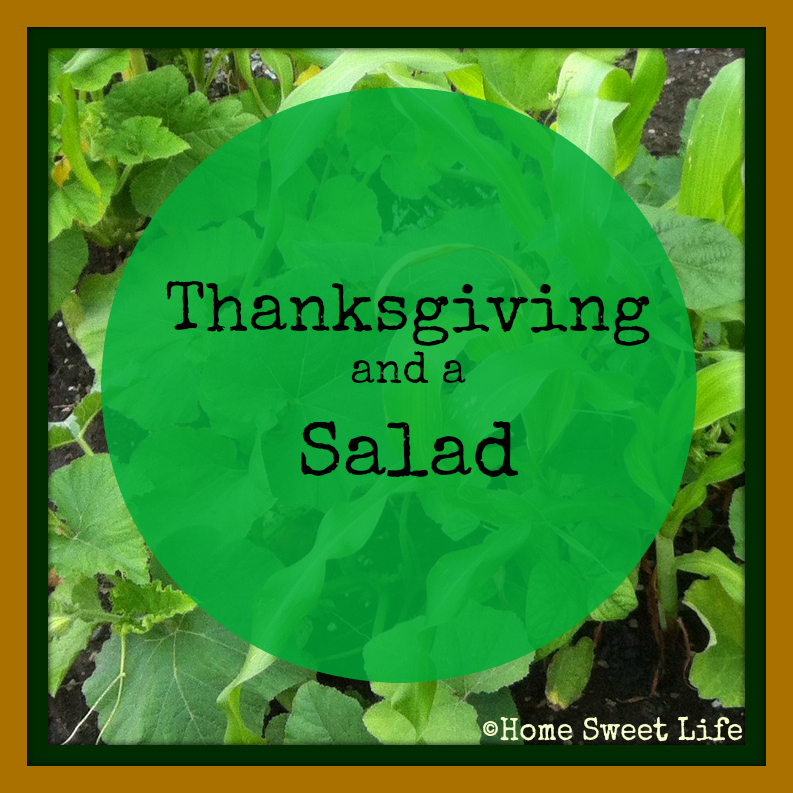 Have a great Thanksgiving - and don't forget the salad! 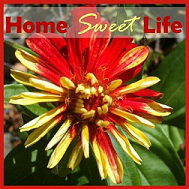 Emily and Arlene are starting a new weekly feature here on the blog. 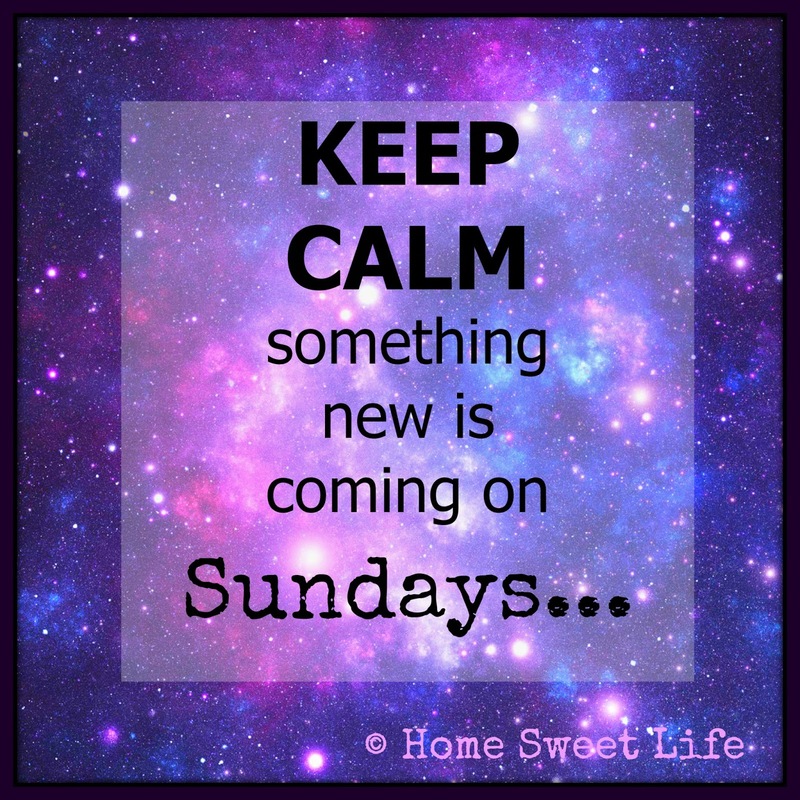 It is debuting this Sunday @3:27 p.m. Sign up to follow us by email, Facebook, Google+ or Pinterest so you won't miss a single one! It's going to be so much fun! These word, spoken as a promise to the Israelites, can bring encouragement still today. It is the Lord our God who gives us all things. 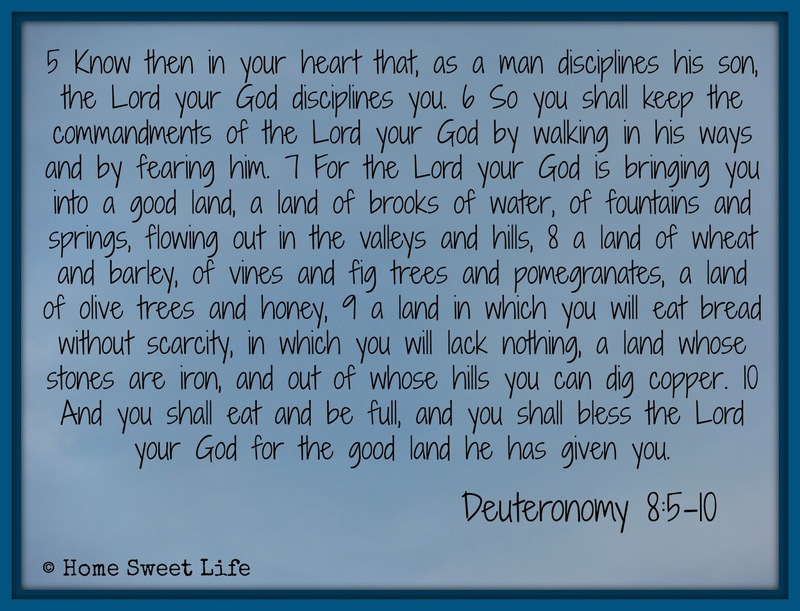 I will continually bless Him for the good land and full life He has given us! 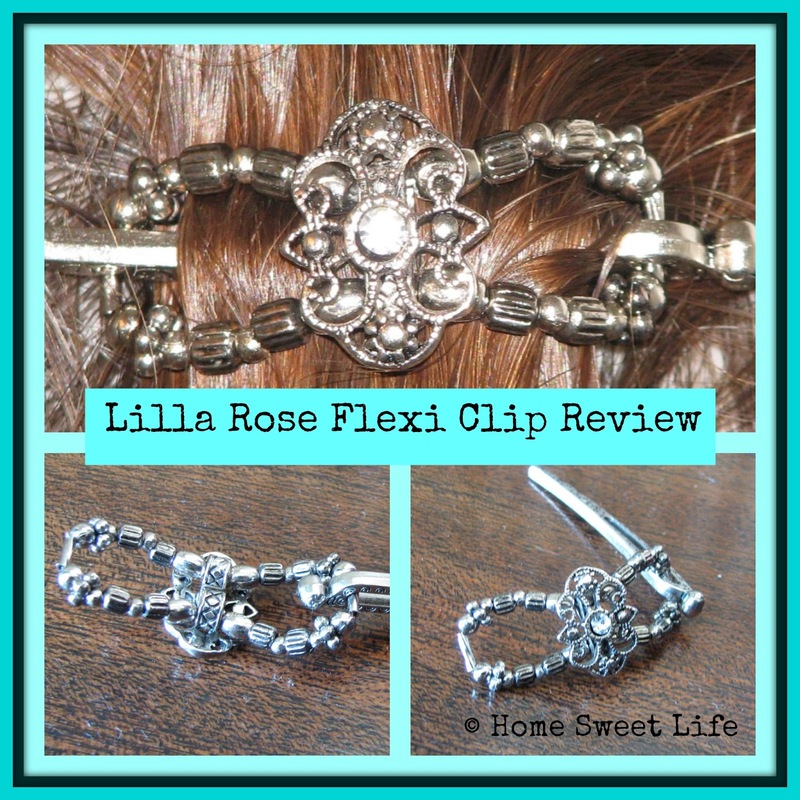 I've been reviewing a Mini Princess Tiara Flexi Clip from Lilla Rose. It has been fabulous! I have worn this Flexi in my hair for anywhere from five to 16 hours and it has held on tight. My hair is fine, and straight. Most hair accessories fall out or slide down early in the day. I was amazed the first time I put the Flexi to the test for a long day. I put it in at 4:30 in the morning, drove two hours to a conference, spent all day, then drove home for a 4-H awards ceremony that evening. When I got home at 8:30 at night it was still holding strong. I have found that with my fine hair, the best option is to put the Flexi Clip in when my hair is either wet or at least still slightly damp as I can get it just where I want, and treat any flyaway hairs right away. I can still put it up easily when its dry, but its always harder to contain my straight hair flyaways once they dry. My hair just ends up with the shabby chic look when I put it up dry. 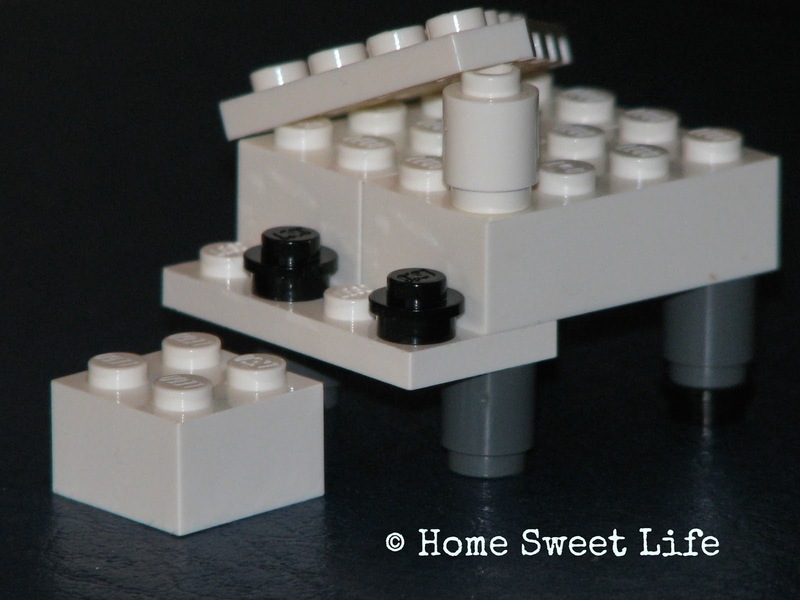 This Flexi Clip is elegant, without being ostentatious. It dresses up my hair, and makes an everyday look classier. There are SO many Flexi Clip designs to choose from. There are over 60 designs to choose from just in the Flexi Mini size! They come in silver-tone, gold-tone, copper, brass, with jewels in a variety of colors, with specialty designs like: musical staff, flowers, or a cross. Your hardest decision might be just choosing a style! Many of the styles are available in various sizes, so you can decide if you want a signature style in multiple sizes, or to pick a different design for each size. 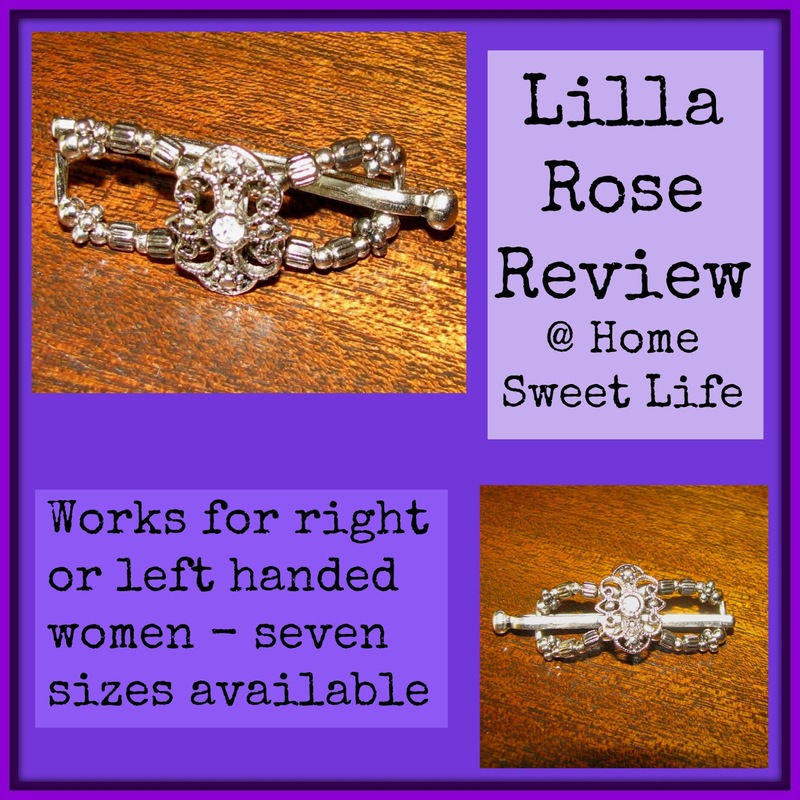 I was familiar with Lilla Rose before this review, because each of our girls have a Flexi. Both of our teenaged girls have a lot more hair than I do, and Arlene's is super thick and wavy. I knew both of their Flexi Clips were entirely too big for my hair. Lilla Rose offers six different types of hair accessories. You can choose the original Flexi Hair Clip, Flexi Oh!, Bobby Pins, Hair Sticks, Hair Bands, and the newest - You Pins. Want to see all the options for hair? There really is something for almost every length and hairstyle. Lilla Rose also offers badge clips. 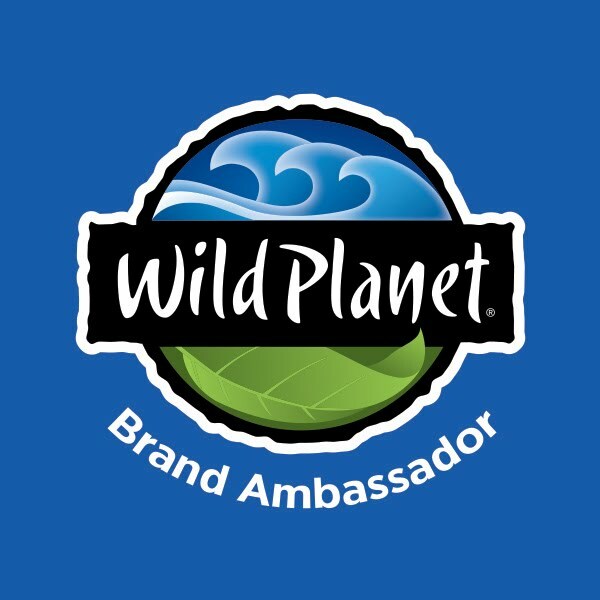 For an overview of all their great products, click here. The headbands intrigue me because they too are sized just for you ... with an adjustable comfort band. Many all-around headbands are too tight for my fine hair and fall out. So with it's adjustable band, I'd like to put one of these to the test too! To choose a Flexi Clip, you need to figure out which of the seven sizes you want for your amount of hair. Truthfully, you're going to want at least two sizes. A smaller one for only putting up part of your hair, and a larger one for putting it all in a ponytail. If you're someone who loves updos, you'll want to get a third one for holding all of your hair in the up and down or French twist styles. See the sizing video here. Watching the video will help you gauge your hair type, texture, length, and favorite styles. I appreciate the Hair Styles tab that helped me think of something new to do with my Flexi in my hair. This page shows you eight different styles and has a video for each. When you watch the videos, you understand how your hair will need different sizes, and can compare your hair to that of the various models for the best fit. Many of the Flexi Clips can be easily used by both right and left-handed wearers alike. Some of the designs have dangles that would look weird if you flipped them around. . . keep that in mind of you're a lefty who has a difficult time doing things with your right hand. The important point is to not overestimate how much hair you have. I knew I needed a Mini Flexi because it's hat season. I'm not likely to want to do a ponytail or an up and down anytime soon. I want to be able to use my Flexi everyday, and this size is perfect for a half-up or a half-twist. I'll look at getting a small for next Spring because I'll want to get all my hair up off my neck. For now, I love the staying power of this Flexi Clip, it even puts up with me wearing a hat everyday. As long as I'm gentle, and not acting like a clown, the Flexi stays in place through a whole day's worth of running in and out of the stores on errands. Lilla Rose's Flexi Clips have this ingenious design that keeps you from losing the bar. This is such a wonderful design, functional and beautiful. No lost parts, and sturdy. For all the sizes larger than a Mini, the size is marked on the bar, making it easy to spot the correct size in your drawer or basket. 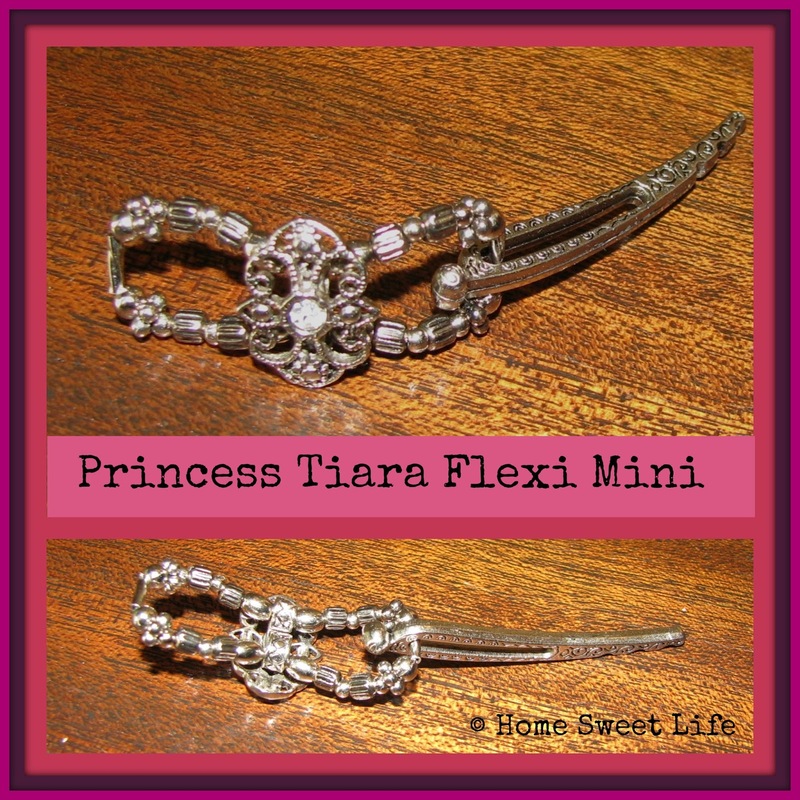 This Princess Tiara Flexi Clip exceeded my expectations. The way that it flexes around your hair makes it highly adaptable. If you look closely in the pictures, you can see that each size clip can be adjusted to three micro-sizes by which dent you slide the bar through to. Just make sure you're running the bar along your scalp to get a good initial hold. Since you're probably wanting to get a Flexi or two for yourself, or as a gift, I decided to have a Lilla Rose party to make it easy for you. If you have any questions, you can contact my Lilla Rose consultant Meg through the link at the top of this page. The party continues through December 1, 2014, so do your shopping from the comfort of home this week and skip the Black Friday weekend crowds! * I received a Mini Flexi Clip in exchange for an honest review. I was not required to write a positive review, I am disclosing this in accordance with FTC regulations. *I chose to host a party with Lilla Rose. If you purchase any items through my party link, I may qualify for additional items for free. Thanks! I am thankful for my boss. Instead of making my job difficult, she makes it easier. She treats our group of employees with respect and courtesy, and she says "Thank You" a lot. I want to remember to be thankful for the big things, and the small ones. 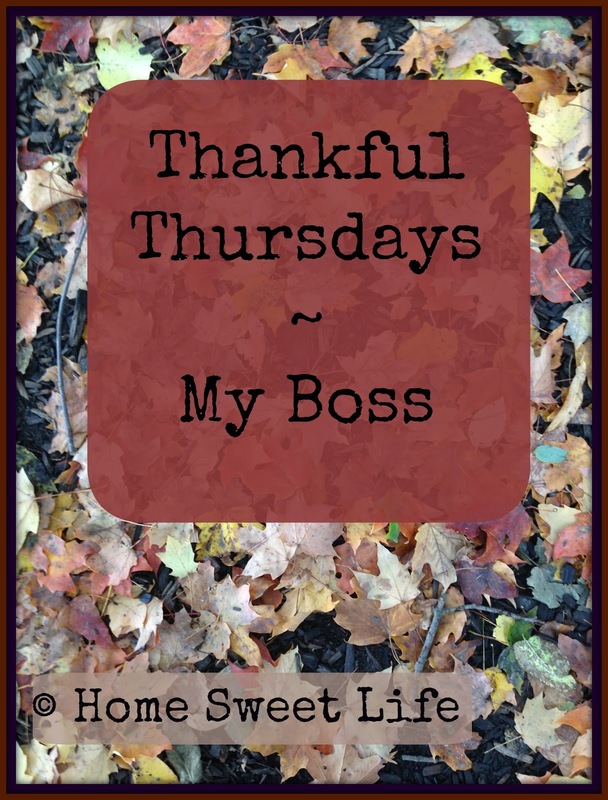 My job is a small part of my life, but my boss is a big reason to be thankful! This is what my kitchen windowsill looks like right now. I always have a couple house plants, aloe (for those times when I burn myself on a hot pan or popping grease,) and a lemon geranium (it's peeking in the left side of the picture,) but I wanted something different, something new for winter. In past years we've dug up our geraniums from the flowerbed and brought them inside to bloom all winter, and last year Arlene dug up a pepper plant to overwinter. We've also entertained parsley for the cold months a time or two. 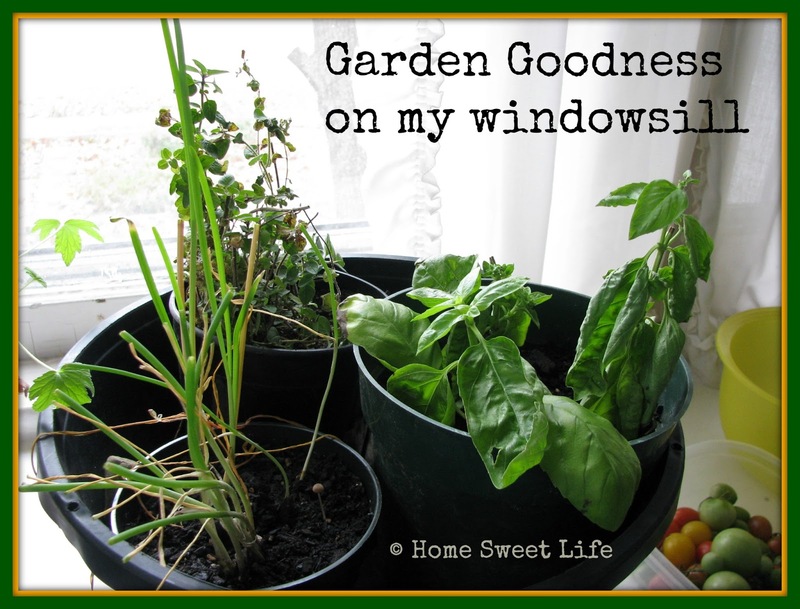 The garlic chives and oregano were easy, I just used my trowel and dug them from the garden. The basil was a little more involved. Actually, it was the basil that started this whole idea in the first place. I had cut some basil to make spaghetti sauce, and of course I cut way more than I needed, so I put the extras in a glass vase to brighten up the kitchen counter. A day of two later I needed the counter space to make something (probably pizza,) so I moved the vase over to the window ledge. Guess what? The basil started growing roots. So I decided if the cuttings were determined to grow roots, I would give then a pot. Voila! I know, thats not a large pot of oregano, but I cut quite a bit that day and its drying for my spice jar. Yeah, its dry already, but I haven't had time to strip the leaves into the jar yet... maybe next week. In case you're wondering, yes, those are tomatoes hiding out in the bottom corner of the picture. We ... (the girls) picked all the green ones before the first frost. While they're not quite as tasty as eating them ripe off the vine, they'll be yummy in tacos! Hope you enjoyed this small peek into our kitchen, and the herbs that will hopefully brighten our days all winter long. 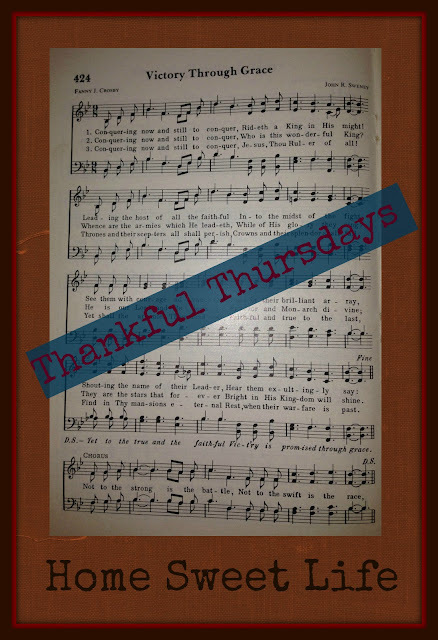 This week I want to say how thankful I am for hymns and hymn writers. Last night at church we sang one on the many inspiring hymns written by Fanny J. Crosby, Victory Through Grace. I grew up in a church that sang hymns, and over the years have been a part of churches that sang some combination of hymns and choruses. Now we sing mostly hymns. I appreciate the hymns more than the choruses. So many of the great hymn writers were inspired to put Scripture in their songs. Not just to talk about Scripture, but to include it in their words. So often, when I'm having a down day, a hymn comes to mind that encourages me or challenges me. Yesterday, Victory Through Grace was that song for me. It was a gentle reminder that Jesus is the Ruler of all, that my hope is in Him, that there will be a victory at the end of the battle. 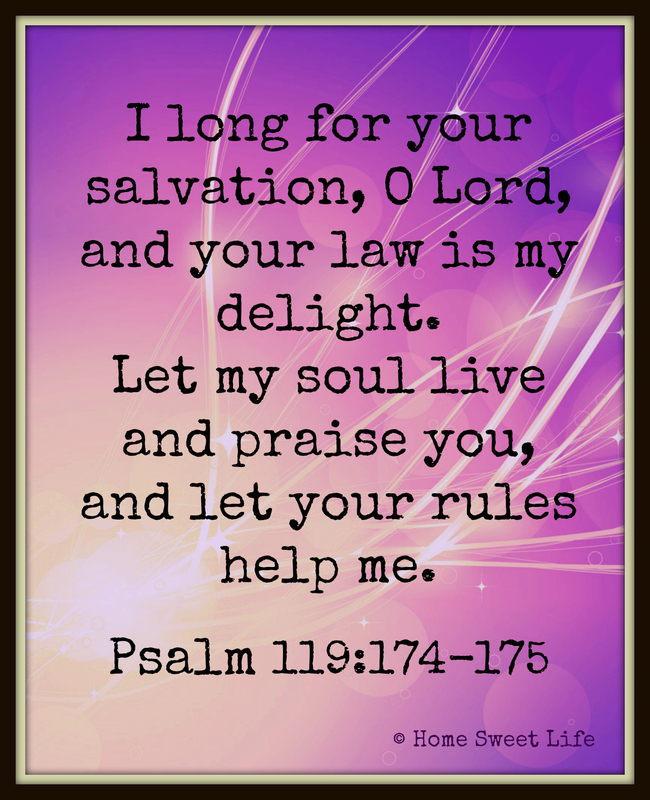 In a time when I'm stretched especially thin, God used a hymn to remind me of His great love, of His grace, of my eternal future with Him. "Not to the strong is the battle, Not to the swift is the race, Yet to the true and the faithful Vic-t'ry is promised through grace." I have just a few favorite hymns, but I think Victory Through Grace is making its way into my top 20 list. 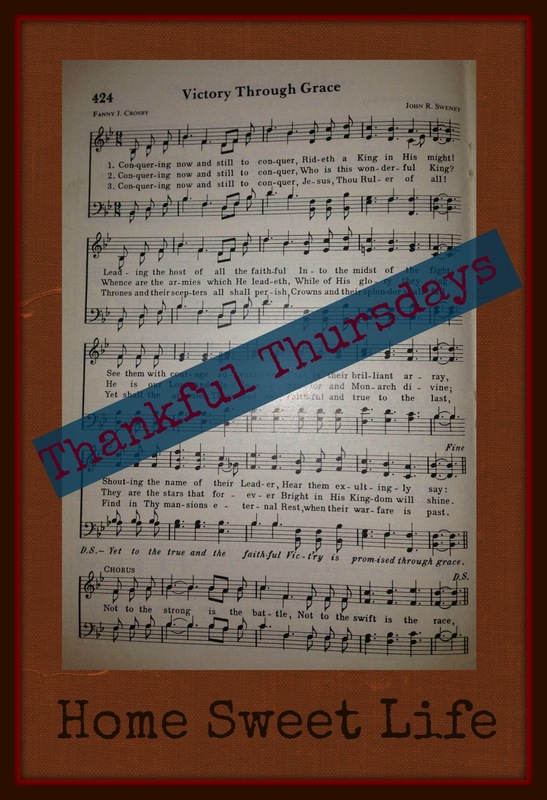 What is your favorite hymn? Leave the title in the comments, it just might make someone's day little more grace-filled! Do you need a good laugh? I mean a really deep - from the belly laugh? 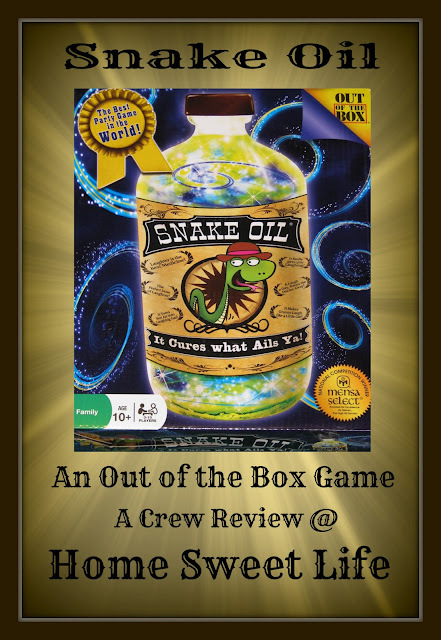 If you answered yes, then you should try Snake Oil from Out of the Box Games! We have been reviewing this game for a little over 5 weeks and I can't remember the last time I laughed this much. The term Snake Oil was originally used to describe a fraudulent health product. Think: the Old West and traveling salesmen! Since we often hear that laughter is the best medicine, this game of Snake Oil is re-writing that meaning. This card game is designed for ages 10 and up, and retails for $19.99. That means for less than one trip for a family of four to the movies, you can enjoy hours and hours of family fun. The girls and I played Snake Oil with a group of their friends, some as young as 9, and had a laughter-filled hour. We have played it over and over again at home as a family as well, it's just that much fun! There are variations of the game included on the instruction sheet, but we just stuck with the original rules. Each player draws 6 word cards, and then each player takes a turn as the customer. When it is your turn to be the customer, put down your word cards and draw from the customer pile. Each of the 28 customer cards has two characters, so you can decide whether you'd rather be the Alien or the Taxi Driver, the Secret Admirer or the Caveman, the Dictator or the Newlywed. After you've chosen your customer, the other players work from their 6 word cards to try to pick the two words that they think will make the best product to sell you. It is not just the title of their product, but their sales pitch (up to one minute,) that you use to decide who wins that customer. Once you decide, you award the customer card to that player, and the next person draws a customer card. After every round that you create a product, you draw two more word cards so you always have 6 to choose from. I think the funniest combination was when the girls' friend Ben chose the Diva side of the customer card and their friend Victoria sold him the "Sparkle Pill." We've had other great combinations, like the "Fashion Hat" that was sold to the Billionaire, and the "Fart Grenade" sold to the Soldier. With this game, it's often the silly product combinations that your friends make up that are even more fun listening to than actually winning a customer card. The basic game has each player taking one turn as the customer, and then whomever has the most customer cards win, however, its so much fun to play that we often go around two or three times. In the example above, you can see that the customer is a cheerleader, and she has four choices. The player being the cheerleader chose the "Fashion Radar" as her favorite product. In the other example, what hostage wouldn't want a rubber lock so they could get home sooner?! Remember, its not just the title, the sales pitch is important. This game provides ample opportunities to be creative! In the pictures above, you can see Arlene's hand of 6 word cards. She has to choose two of them to make a product to sell to a Dumpster Diver. What product could you create out of two of those words? On the left you'll see some of the customer cards, where the Snake Oil snake is dressed up in character. The bottom shows Arlene and Emily playing Snake Oil with their friends one Sunday afternoon. I cropped out their friends to protect the (almost) innocent, because I forgot to ask their parents' permission to use the photo -oops! Overall, we highly recommend this game. Both girls picked it as one of their favorite reviews of the year. I will mention just a couple things, even though this is designed for ages 10 and up, you can play it with younger kids. Two of their friends that played are both 9. (There is a younger kids' version for ages 8 and up.) If you're going to play this often with children under 12, you might want to edit out a few of the cards. This would also apply if you're quite conservative in your views, or want to make it all-kid friendly so they can play without you. 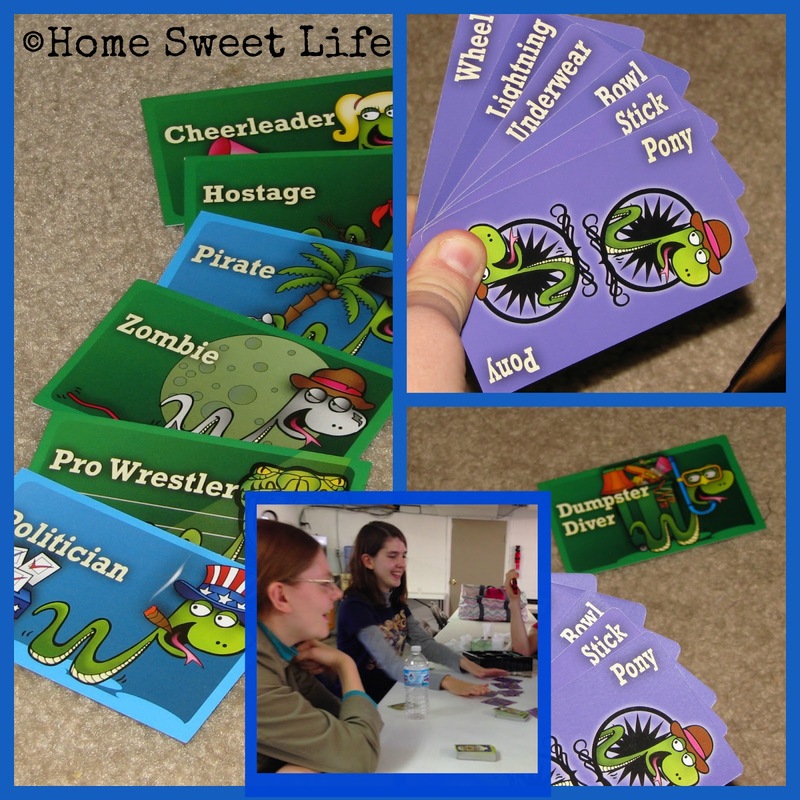 When we played with the younger kids, we chose to not use some of the word cards. There are a few you might want to remove. Out of the 336 word cards, I can see 11 you might want to remove: poop, shame, alcohol, hell, murder, hormone, bra, booger, revenge, vomit, and underwear. That still leaves you over 300 words to create your products from. In the customer cards, we left them all in play, but you might wish to remove: executioner, witch, and gangster, (this would mean you're also removing protester, politician, and prom date.) Our girls are 14 & 16, so we leave them all in. I just wanted you to be aware of these few cards in case you order this as a holiday or birthday gift and want to remove them before revealing the game. Snake Oil is a fun game for the whole family. When we've played, the adults have had just as much fun as the kids. This is definitely family-friendly! 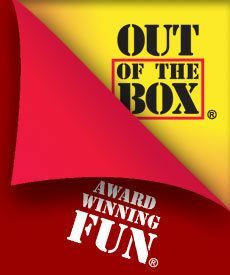 You can connect with Out of the Box Games on Facebook, Twitter, and YouTube. 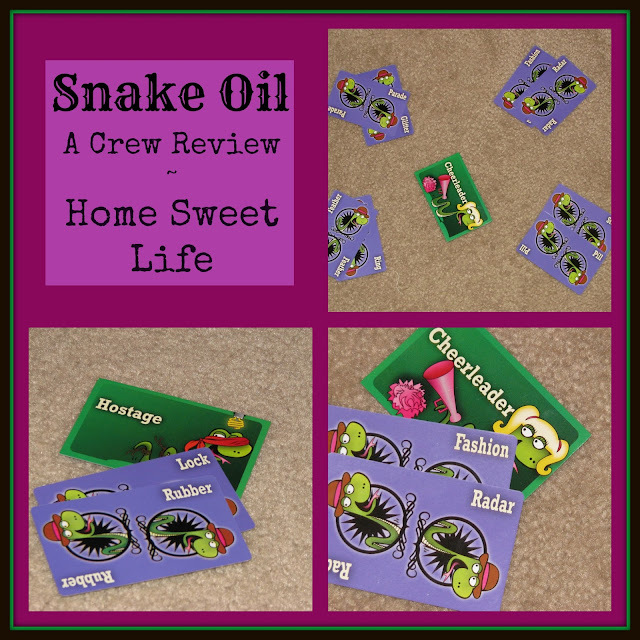 Dozens of Crew families joined in on this review, for both Snake Oil, and Snake Oil- Party Potion for younger kids. Click the banner below to read all the reviews! What happens when a former Nasa employee writes a coffee table style book on creation? 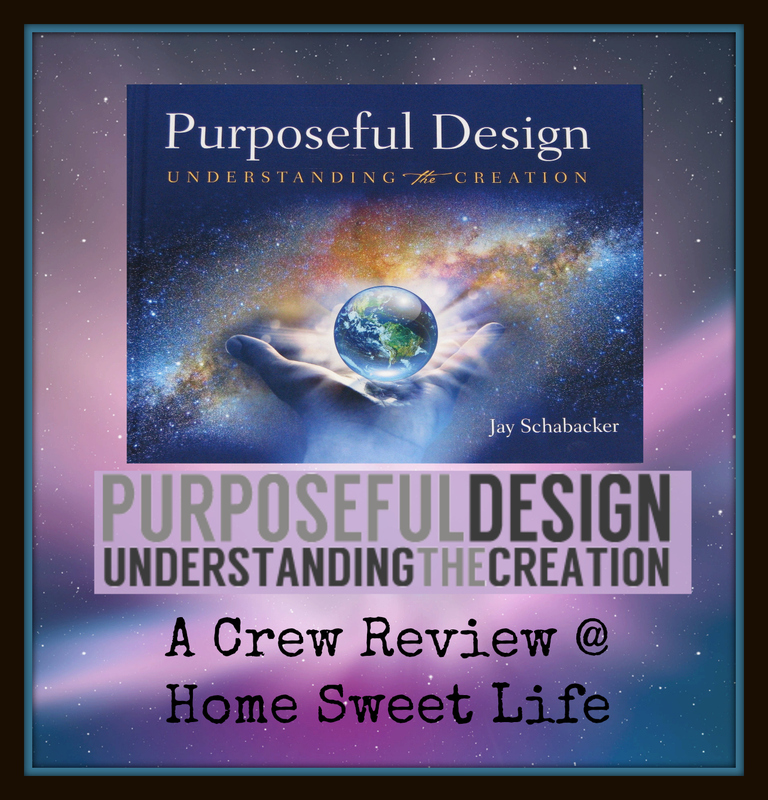 You get Purposeful Design: Understanding the Creation by Jay Schabacker at Purposeful Design. We were privileged to review this book for the Schoolhouse Review Crew. Mr. Schabacker's past, and his attention to details large and small, both while working with the Apollo Moon Program, and while working in business and personal investment shine through in this beautiful 90 page hardback book. The text of this book presents the week of creation, and several compelling evidences for a Purposeful Designer, while photos and illustrations delight the eye. I appreciated this in-depth, but not overwhelming, look at how several parts of our universe point directly back to God as the Creator. Each section begins with a lovely photo highlighting the portion of the Genesis story for each day of creation week. Mr. Schabacker approaches the creation of our world with wonder and awe, just as we should! He tells about how today's science can help us understand just how specifically each part of our universe was designed for our benefit. I really liked how in the Day three section Mr. Schabacker reminds us of how regularly consistent the sun rises and sets, and how mariners can plan their work around the regularity of the tides that are pulled by the moon. This book would make a great read-aloud for your family, or a basis for studying the creation week with your children or students. If you're wanting your students to study creation, Mr. Schabacker has created a "Young Explorer's Club" curriculum to go alongside the Purposeful Design book. This free downloadable curriculum has a section for each day of creation (3-5 pages) that corresponds to what you will read in the book. The curriculum asks the student to really think and search out what God did during each day, and how He did it for our benefit. There is a section to choose their favorite part of the creation story and make it their own memory verse. 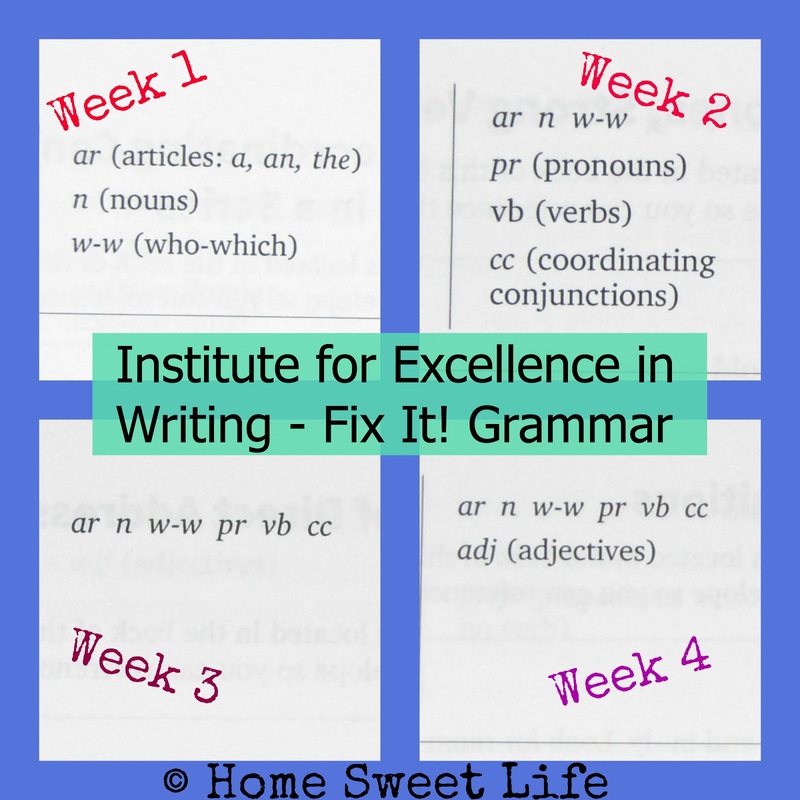 You could use this with your elementary students with some help from Mom and Dad, or a classroom teacher, while I think your Middle School ages students could work independently on the curriculum and then discuss it. This could make a quality seven or eight week co-op class. 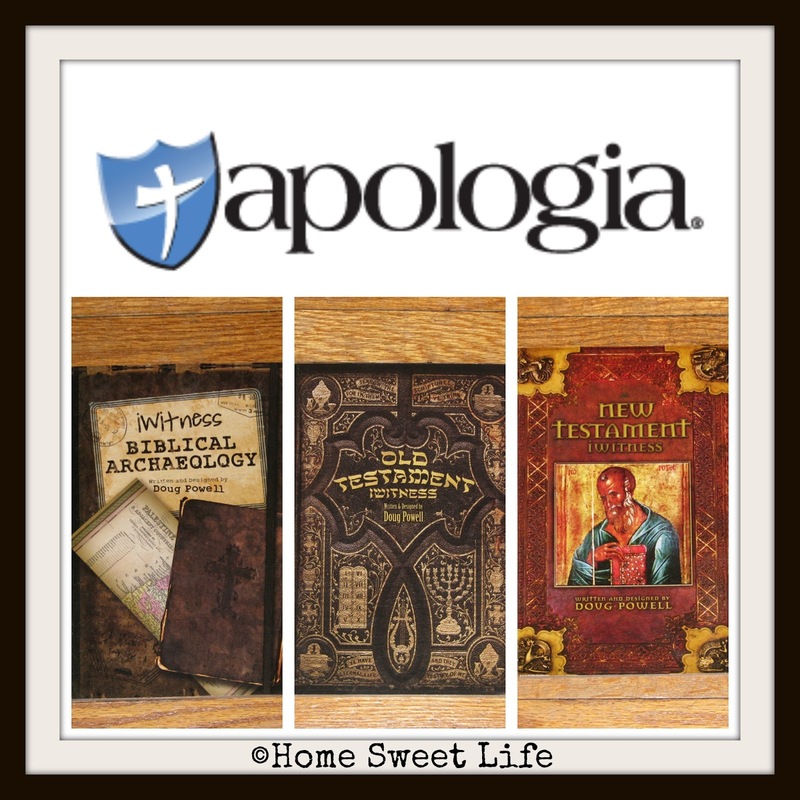 Purposeful Design would make a great gift for your own family, or to bless another family. Appropriate to use with all ages, this book will appeal to both children and adults with its variety of great photography. The book contains not only the creation story, but many other Scripture references that point to God's creation and His great loving care of us. This book could be used as an outreach tool to share with non-Christians. The book sells for $18.95. Because of his great love for reaching others with the love of Christ, Mr. Schabacker offers bulk discounts if you wish to purchase 10 or more copies. Purposeful Design: Understanding the Creation is a beautiful book that talks simply and thoroughly about the creation week. Its chapters each start with verses from Genesis 1 and then continue by talking about the subject in question with interesting facts and colorful pictures. Chapter 6 in particular goes into detail by talking about different features of the human body. Chapter 7 quotes many verses about the works of God and how, while we admire all of creation, we can never fully comprehend it all. Each chapter is small, making it the perfect size for a family devotional or a book for before bed. 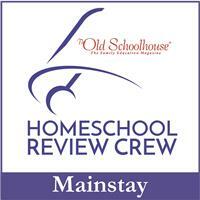 Dozens of Crew families reviewed Purposeful Design: Understanding the Creation, click below to read all their reviews.